On April 11, 2017 McDonald’s Korea announced the recognition of IUF affiliate Arbeit Workers’ Union as the collective bargaining representative for McDonald’s workers. The union formally established a McDonald’s chapter in November 2016. A first meeting was held on June 16, and a second one is scheduled for July 21 during which parties will discuss ground rules. After this first step, Arbeit Workers’ Union will submit the list of demands and negotiation for the first collective agreement will formally start. The agreement comes after strike action in April in response to the company’s refusal to increase wages above the national minimum wage. Key improvements include: wages above the minimum wage for all Restaurant Brands employees; provision to offer vacant shifts to existing staff; a working party to review the vacant shift processes; weekly rosters with fixed and vacant shifts will be published in each store; elected health and safety representatives; and up to two weeks additional payment for redundancy. The union recently reached a similar agreement with McDonald’s. The mayor of New York has signed a package of bills benefitting some 65,000 fast food workers, the key component of which is a requirement that fast food restaurants schedule their workers at least two weeks in advance or pay extra for shift changes. The legislation, strongly supported by the IUF-affiliated SIEU and leaders of the FightFor15 campaign, also ensures that fast food workers have breaks of at least 11 hours between shifts and are given the option of working additional hours before their employers hire extra workers. With several states and municipalities having increased their minimum wages to as high as USD 15 an hour in recent years, scheduling in the often unstable fast-food sector has now become the key issue for unions and advocates for the rights of low-wage workers. 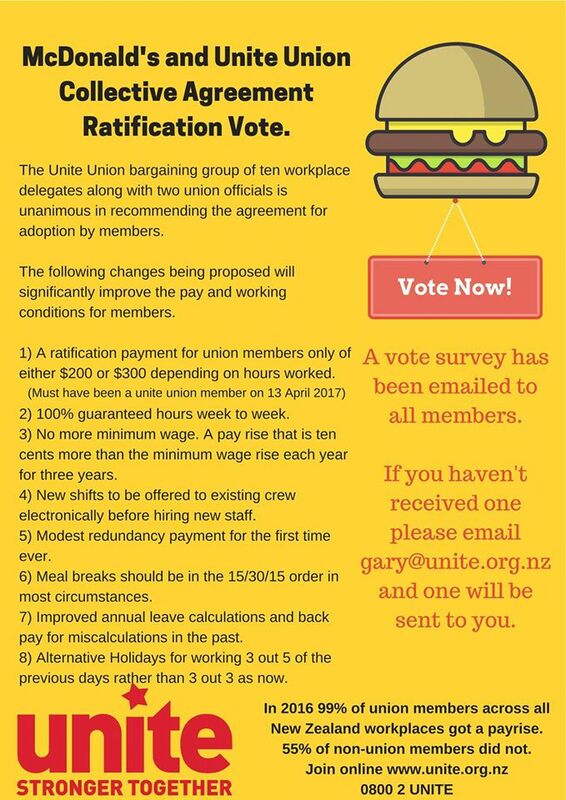 Members of the IUF-affiliated Unite Union in New Zealand have overwhelmingly endorsed the agreement reached by the bargaining group and McDonald’s. The main points of the agreement are pay increases of the minimum hourly wage plus NZD 10 cents each year for three years, 100% guaranteed “agreed hours” each week every week, additional available shifts to be notified electronically before new staff are hired, and a two-week redundancy payment if a store closes, which is a first step in this area. The agreement covers all McDonald’s restaurants in New Zealand, including those franchised, and the improvements apply only to Unite members. More information and the full terms of settlement are available on Unite Union website. At the end of April 2017, McDonald’s announced it will offer fixed contracts with a minimum number of guaranteed hours every week to some 115,000 UK workers on zero-hours contracts. The change from zero-hours to fixed contracts comes after months of campaigning by the IUF-affiliated BFAWU. Since last October, German fast-food workers have been in a conflict with employers over fair pay and a living wage. In collective bargaining with the German food workers union NGG, the companies have offered a wage which is considerably below what the German government calculates as the minimum needed to build for a decent retirement. Since the start of this year, more than 1000 workers and supporters have participated in protest actions and warning strikes at McDonald’s, Burger King, Starbucks, Pizza Hut and Autogrill. The employers have shown no serious willingness to negotiate a living wage. Support German fast-food workers in their struggle for fair wages – CLICK HERE TO SEND A MESSAGE to the employers who refuse to pay a living wage! Unite Union members at KFC, Starbucks, Carls Jr and Pizza Hut went on nationwide strike on April 22 to launch their campaign for a living wage. Workers voted overwhelmingly to take strike action against Restaurant Brands, the company which manages the four brands’ New Zealand operations, after negotiations for a new contract broke down over the company’s refusal to raise wages. Restaurant Brands rejected a very modest proposal from the union for a rise of 10 cents an hour each year over three years above the minimum wage for the lowest paid workers. The union also wants increases for shift supervisors, skilled and experienced staff who are able to run restaurants, that will move them towards a living wage. The German Food and hospitality workers’ union NGG announced that it would be preparing industrial action in the fast food sector when a third round of negotiations with employers failed to produce a meaningful offer from the employers on January 23. Starbucks responded by attempting to recruit workers in Poland to “volunteer” to “support” full service at Starbucks coffee shops in Germany in the event of strikes. The qualifications were: basic German language skills, an EU passport and flexibility. The NGG strongly condemned Starbucks and publicized these attempts at organized strikebreaking. When protests were organized in front of Starbucks outlets in Warsaw and Poznan, AmRest, the company which operates Starbucks in Central Europe and in Germany, abandoned its attempts to recruit strike breakers among their Polish workers. On November 29, thousands of Fight for 15 protesters rose up in 340 cities across the US, chanting, marching, sitting in and affirming their determination to continue the fight regardless of who is in the White House. Many were arrested for civil disobedience. A city council member from Brooklyn, who participated in the Manhattan sit-in, said “The courage, vision and solidarity that the Fight for 15 has shown is exactly what we need not only to resist Trump, but to put forward a forthright vision of the country we want”. The same day in Brussels, McDonald’s workers from Belgium, France and the UK were at a hearing before the European Parliament’s PETI Committee (Petitions Committee) to highlight precarious working conditions in their respective countries. The petition, which has collected over 32,000 signatures and is still open for signing here, calls for an end to zero-hour contracts, closing legal loopholes in around part-time hiring and an end to employer resistance to workers organizing trade union committees. The IUF-affiliate Unite Union and Restaurant Brands, which owns the rights to market KFC, Pizza Hut, Starbucks and Carl’s Jr brands in New Zealand, have signed an agreement which fully guarantees workers’ hours and shifts. The collective agreement signed in 2015 had a formula that guaranteed hours at 80% of the previous three months worked. The new, amended agreement transitions to 100% guaranteed hours and fixed shifts. The passage of the law to ban zero hours contracts in New Zealand set the stage for this change to be negotiated. Employers will enter into discussions with each worker to reach agreement on fixed hours and shifts based on what they have actually been working. Employees will also be offered additional shifts when they become available up to a maximum of 40 hours a week, offering the opportunity for stable, secure full-time employment. Unite National Secretary Gerard Hehir calls this is a massive win for workers. However, Unite has accused McDonald’s and Burger King of trying to deny workers their rights under both the collective agreements and the law. According to the union, McDonald’s has been putting many new staff on three-hour minimum contracts and refusing to pay compensation for being available to work additional shifts as required by the law. They are also refusing to offer hours to existing staff before hiring new staff. Burger King has not implemented the guaranteed shifts specified in the collective agreement they signed last year under public pressure.